The charming community of Wood Ranch is set among majestic terrain and nestled in the hills between Simi Valley and Thousand Oaks. Located in Ventura County, This Community is dedicated to offering its residents a clean, safe and desirable environment and lifestyle to enjoy. 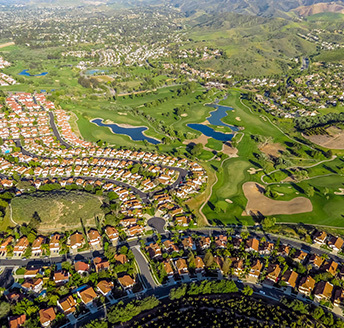 Surrounded by acres of undeveloped land and adorned with a serene community lake, beautiful parks and a lush landscape, this wonderful area within the city limits of Simi Valley is just an hour from the bustling city of Los Angeles. With a nearby police and sheriff station, local fire station and 24-hour patrol, Wood Ranch is rated by the FBI as one of the safest communities in the United States and proudly ensures a secure way of life. Ventura County’s location offers great versatility, in which mountains, valleys, and seashores subsist within it and offer six different micro-climates – more than any other county nationwide. Characteristic of the area, the exceptional weather is ideal for numerous activities throughout the year and so there are a wide variety of recreational opportunities to maintain an active lifestyle which include favorite pastimes of the residents like hiking and horse trails, biking, jogging and swimming, as well as the exclusive Wood Ranch Golf and Country Club in addition to other champion golf courses in nearby areas, offering a wide selection of lush green turf. Relax on the beach or at a concert in the park. Sail the Channel Islands, or hike the Angeles National Forest. Camp or fish at one of the nearby lakes, or surf at some of the best surfing beaches in California.